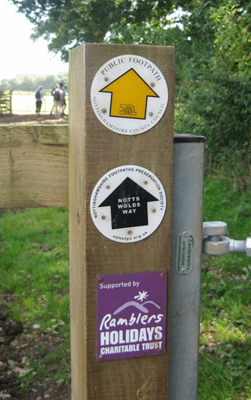 Tuesday 23rd August saw the launch of the Notts Wolds Way, a new linear walk of 26 miles, set up by the Nottinghamshire Footpaths Preservation Society. The path, from Bunny to Cropwell Butler, is divided into 4 stages, each passing through an attractive and interesting part of south Nottinghamshire. Although there are a few short road sections, the route is mostly on rights of way in the form of field and woodland paths and tracks. The majority of these were already in existence but the route also makes use of several new paths which have yet to find their way onto even the latest OS maps. The route has been way-marked throughout with a characteristic black arrow on a white background. The launch of the path took place at Bunny Village Hall, followed by a walk of the first stage from Bunny to Willoughby on the Wolds. 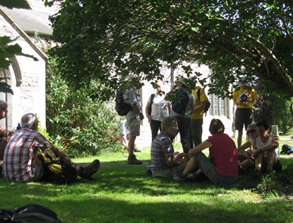 The opening ceremony was performed by Jeremy Colls of the Ramblers Holidays Charitable Trust, which provided financial support and encouragement for the project. Support was also provided by Notts CC. 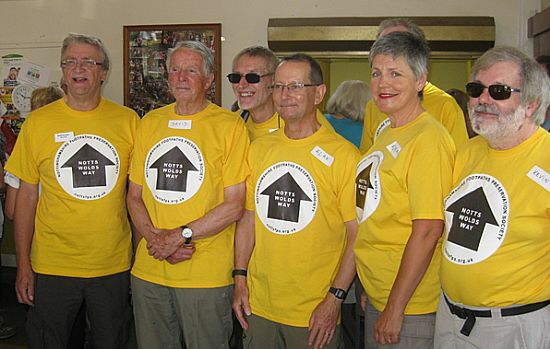 Some 56 walkers took part in the inaugural walk on a splendid warm summer’s day.